The standard engine in the 2019 Ram 2500 and 3500 Heavy Duty is upgraded to the proven and potent 6.4-litre HEMI V8, delivering class-leading 410 gas horsepower @ 5,600 rpm and 429 lb.-ft. of torque @ 4,000 rpm to handle the payload and towing requirements of the heavy-duty truck user. "Ram Heavy Duty owners constantly demand the highest levels of capability to tackle the biggest jobs and with 15,921-kg. (35,100-lbs.) of towing capacity, pulled by 1,000 lb.-ft. of torque from our Cummins engine, we now hold the most important titles within the segment," said Reid Bigland, Head of Ram Brand, FCA. "We've also surrounded owners in luxury and technology that, until now, was unavailable in a heavy-duty pickup. The highest quality interiors, active safety systems and of course our award-winning Uconnect technology contribute to the best Ram 2500 and 3500 trucks we have ever built." With a long list of upgrades, the new Cummins 6.7-litre High Output Turbo Diesel delivers up to 1,000 lb.-ft. of torque @ 1,800 rpm and 400 horsepower @ 2,800 rpm. Changes begin at the core, with a cylinder block made from compacted graphite iron. Overall, the new Cummins Turbo Diesel weighs 27 kg (60 lbs.) less than the previous-generation engine, yet delivers more power and torque. A new cast-iron cylinder head builds on the new block with changes that include new exhaust valves and springs, and new rocker arms. Lighter and stronger pistons include new low-friction rings and connect to the crankshaft via newly design forged connecting rods and new bearings. An all-new exhaust manifold is the mounting point for an improved variable-geometry turbocharger with laminated heat shields, delivering boost pressure up to 33 psi. The standard engine in the 2019 Ram 2500 and 3500 Heavy Duty is upgraded to the proven and potent 6.4-litre HEMI V8, delivering 410 gas horsepower @ 5,600 rpm and 429 lb.-ft. of torque @ 4,000 rpm to handle the payload and towing requirements of the heavy-duty truck user. Ram Heavy Duty trucks powered by the standard output Cummins 6.7-litre Turbo Diesel are equipped with a significantly upgraded version of the 68RFE six-speed automatic transmission. Changes designed to improve the electronically controlled transmission's shift quality include new variable-force solenoid controls for the torque-converter clutch. A new reverse accumulator improves shift feel when placing the transmission into park from reverse. Drive-to-park shifts were also improved through refined hydraulic control. In a first for the Ram Heavy Duty, the 6.4-litre HEMI V8 comes paired to the proven and smooth-shifting TorqueFlite 8HP75 eight-speed automatic. There are more than 40 individual shift maps to optimize shift points for fuel economy, performance and drivability. The transmissions use shift-by-wire technology, eliminating a mechanical linkage between the transmission and the gear selector. The 2019 Ram Heavy Duty uses an innovative rotary e-shift dial mounted on the left side of the instrument panel's centre stack - freeing up space traditionally occupied by a console- or column-mounted shift lever. Ram Heavy Duty trucks with the high output version of the Cummins 6.7-litre Turbo Diesel are equipped with an all-new part-time BorgWarner transfer case (BW 44-48). This transfer case is designed to handle the higher input loads for maximum towing capability up to 15,921 kg. (35,100 lbs.). A new braking system upgrades the calipers, booster and master cylinder. Combined with a larger-ratio pedal swing, the 2019 Ram Heavy Duty delivers a more confident and powerful execution with little effort from the driver. The 2019 Ram Heavy Duty is the most powerful, most capable pickup in the segment, the manufacturer states, with a towing capacity of 15,921 kg (35,100 lbs) and payload capacity of 3,484 kg (7,680 lbs). But big capability is irrelevant if the truck fails to instill confidence to the driver. Ram redefines the phrase "you don't even know it's back there" when towing or hauling. Ram Heavy Duty trucks feature all-new frames built with 98.5-percent high-strength steel, six separate crossmembers, hydroformed main rails and fully boxed rear rails for optimal strength and mass efficiency. Although the new Ram Heavy Duty is stronger and more capable, lightweight materials in the frame, powertrain and an aluminum hood reduce overall weight by up to 65 kg (143 lbs.). Two Active-Tuned Mass Modules (ATMM) mounted on the frame rails search out unfavourable vibrations and apply countermeasures to eliminate them. Wide front frame rails enable front suspension springs to be positioned slightly outboard - an enabler for generating positive roll stiffness. In the rear portion of the new frame, the structure includes fully boxed rear rails. The rear-axle structural crossmember with provisions for fifth-wheel and gooseneck hitches, has been upgraded for 2019 to accommodate the increased towing capacity. On vehicles equipped with the optional auxiliary camera prep package, the standard 4/7-pin bumper connector is replaced with a 12/7-pin connector to support the remote camera option (available Mopar accessory). A tailgate handle-mounted, rear high-definition camera backup system is standard with dynamic imaging on the 12-inch, 8.4-inch or 5-inch displays with turning guidelines. Also, the cargo-view camera located in the Centre High-Mounted Stop Light (CHMSL) provides a view of the bed for easier connection to fifth-wheel or gooseneck trailers, as well as monitoring bed loads. A class-exclusive Active-Level rear air suspension is available on both the Ram 2500 and Ram 3500 and includes a new Bed-lowering Mode to make the heaviest trailer hook-ups a breeze. The 2019 Ram 2500 uses two air bags to replace the coil springs. Load capacity is not sacrificed and the Ram 2500's ride and handling gets even better, crushing the competition with two doses of engineering innovation (five-link coil with an air suspension option). The Ram 3500 features a Hotchkiss rear leaf-spring system with optional air suspension. By adding supplemental air bags, Ram engineers were able to soften the heavy-load leaf springs, allowing for more unladen suspension movement. Several body elements are upgraded from mild steel to high-strength steel on the 2019 Heavy Duty pickups. Additional light-weighting efforts consist of an aluminum hood, which contributes to an overall weight reduction of up to 65 kg (143 lbs). 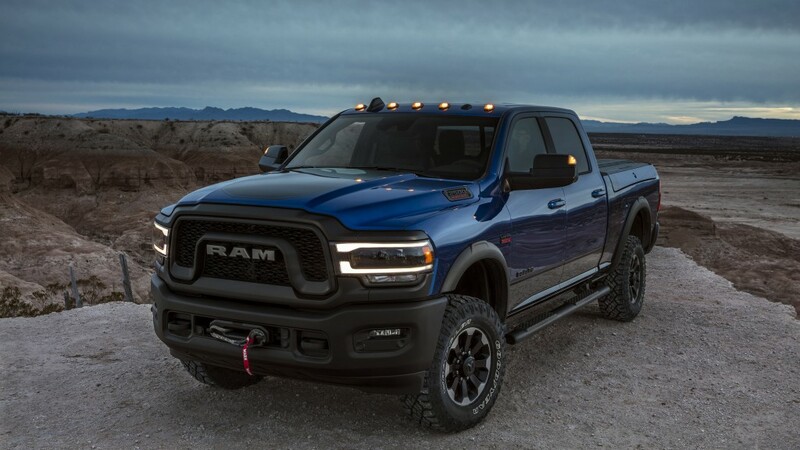 2019 Ram Power Wagon is the most capable production off-road truck in the industry. The Power Wagon features a unique suspension, factory suspension lift, locking front and rear differentials, disconnecting sway bar and a 5,443 kg (12,000 lb) winch. New to the Power Wagon is a 360 camera, which includes forward-view camera gridlines to help navigate obstacles. An all-new and integrated front-mounted WARN Zeon-12 winch features a unique fairlead and fairlead retainer with a new synthetic line that cannot kink, does not fray and is more manoeuverable. The new line also cuts weight by 13 kg (28 lbs). A Power Wagon content package continues to be available on Tradesman, which includes all the off-road equipment but keeps the Tradesman design elements. The new Ram Heavy Duty uses a variety of high-strength steels in the frame, body panels and core structure to maximize impact performance and reduce overall weight, including the A-, B- and C-pillars, front structure and door beams. Automatic Emergency Braking (AEB), 360-degree camera display and selectable tire pressures are just some of the new, specialized technologies found in Ram's halo pickup trucks. Since the Ram Heavy Duty line is engineered around capability, it makes sense that many of the technologies would be enhanced from their use in passenger cars. For example, Tire Pressure Monitoring, which can monitor up to six tires on the pickup, now includes trailer tire pressure monitoring for up to 12 trailer tires. Although a back-up camera is a standard feature on most vehicles, the Ram Heavy Duty offers a second rear-view camera (cargo-view camera) to monitor payload in the bed. It also can be used to align fifth-wheel and gooseneck trailers, a common task of the Ram Heavy Duty pickup. As a segment-first, back-up sensors on the Ram 3500 include specifically designed sensors to cover the added width of dual rear wheels, giving a wider span of coverage when backing up with limited view. An active noise cancellation system and acoustic glass reduce ambient cabin sounds by nearly 10 db - the quietest Ram Heavy Duty ever. The new HVAC system features 30 percent more air flow at lower noise levels, including larger front defroster vents for better performance. All-new in-duct electric heating elements on diesel models help speed cabin warmup on cold days, and larger system controls and new larger panel ducts work better with gloved hands. Robust sections combined with "interlocking" design aesthetics also function to improve aerodynamics to surround segment-leading capability and technology. Every Ram Heavy Duty truck benefits from new content specifically designed to match each model's unique style. Rather than a traditional focus on styling elements individually, designers combined elements that influence each other's shape, resulting in a more integrated look that aligns with the mechanical capabilities of the truck. For example, the grille, hood and fenders share pieces of each other, as well as the instrument panel, cluster and centre console. Surrounding the largest cab in the segment, the interior design team brought unique colours and premium materials to each trim level of the 2019 Ram Heavy Duty. Each model makes its own unique "Hero" statement with paint colours, badging, wheels, grilles and other features.